Living a Fit and Full Life: Recover Faster with Organic Valley's New Organic Fuel Vanilla & Chocolate Organic Whey Protein Powder! Recover Faster with Organic Valley's New Organic Fuel Vanilla & Chocolate Organic Whey Protein Powder! Organic Fuel is the only organic recovery shake make with real milk! Forget the chalky powder. We get our 26 grams of protein straight from the source, the naturally occurring casein and whey found in real, organic milk. Fast-acting whey protein helps promote muscle growth and strength while slow-acting casein inhibits the breakdown of protein and protects muscles. These proteins work together to help you build lean muscle, alleviate soreness, and keep your body performing at its peak. We like to keep it simple, too! Organic Fuel is made with nine wholesome and organic ingredients, so you know you're getting all the good stuff you need—and nothing else. Our protein comes from real organic milk made by pasture-raised cows on Organic Valley family farms near you. Recover faster and get stronger with Organic Fuel. Organic Fuel Whey Protein Powder is a great-tasting, nutritious, high-protein whey powder. It is ideal for post-workout recovery or meal replacements for athletes looking to increase their protein consumption. It was developed to support the body’s muscle recovery after physical exertion like biking, running, sports competition and gym workouts. Organic Fuel Whey Protein Powder is packed with protein, natural carbohydrates and essential nutrients from a simple list of organic, fair trade ingredients. It does not contain unnecessary additives you can’t pronounce, artificial flavorings or sweeteners, GMOs, pesticides, antibiotics or hormones. What you do get is powerful nutrition from a trusted brand. Organic Valley Organic Fuel Whey Protein Powder contains (per serving) 26 grams of whey protein, only 3 grams of sugar and is a good source of calcium, all in a convenient powder you can take anywhere. It mixes smoothly into liquids (smoothies, water, milk or juice). 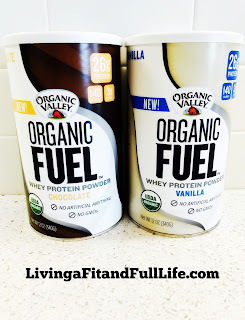 Organic Fuel Whey Protein Powder comes in two delicious flavors: Vanilla and Chocolate. Recover faster with Organic Valley's new Organic Fuel Vanilla & Chocolate Organic Whey Protein Powder! As a runner I know the importance of protein powder, especially a quality organic whey protein powder like Organic Fuel. Protein helps your muscles recover quicker and since Organic Fuel's Vanilla & Chocolate Organic Whey Protein Powder is packed with protein, natural carbohydrates and essential nutrients from a simple list of organic, fair trade ingredients and doesn't contain unnecessary additives you can be sure your body is getting the proper nutrition to recover properly before your next run or workout. Of course all this good stuff does you virtually no good if it doesn't taste good enough to drink, which is why I'm happy to report that Organic Fuel's Vanilla & Chocolate Organic Whey Protein Powder is also quite delicious. It's perfect for a quick breakfast, lunch or recovery drink after a tough workout and is sure to help you achieve your goals quicker than ever. Organic Fuel's Vanilla & Chocolate Organic Whey Protein Powder is just what you need to help you achieve your fitness goals! Click HERE to locate a store near you that sells Organic Fuel Products! To learn more about Organic Fuel click HERE! 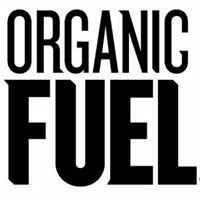 Follow Organic Fuel on social media!